This interview took place on: 11/7/14. JFH (Alex Caldwell): Hi Mike. Where are you calling from today? Mike Donehey: Um (pausing a bit) where am I today? Baltimore. JFH (Alex): On the Third Day "Move" tour in Lowell, Massachusetts you climbed around the balcony of the old theatre we were in, then you came way out into the audience and stood on the back of my chair and sang. Have you ever fallen or gotten hurt doing that kind of stuff? Mike: No, Thankfully. I've fallen off chairs a few times, but nothing too serious. I try to stay 'low' if I can. JFH (Alex): Have you ever seen Jon Foreman from Switchfoot climb around scaffolding during a concert? I saw him climb around quite a bit at a show this summer, and I could see the big security guys and promoters visibly sweating as they tried to get him to come down. You guys should have a 'climb off" someday to see who can do the craziest, mid-song assent." Mike: No way! Foreman is crazy, he gets up so high. I'm not built for that kind of risk. I like to keep lower to the ground. JFH (Alex): I've been listening to "No Man Is An Island" since the summer, and it really hit me that so much of life nowadays can be tailor made to fit your preferences. Mike: That's exactly right. When you can program your social media world to allow some people in and block others out, then you can really get a warped view of other people, and your need for them. If our capitalistic culture says 'it's all about you' enough times, then it becomes easy to believe. That's particularly tough when it come to the Church. We're called to be in each other's lives, to be the Church. JFH (Alex): That's the idea behind the new album Cathedrals right? Mike: Right! You are not special or unique because of your accomplishments, as great or noble as they might be. A believer is special because they are a vessel for the Holy Spirit to indwell. It's so easy to roar against the culture. It's what we've been taught for so long in many of our circles. But what if we were different in a way that was really counter-cultural? What if we saw each other as vessels of God's spirit and not just as objects in the way of what we want. JFH (Alex): You have kids right? Isn't having children an interesting thing in relation to having life "your way," tailored to exactly what you want it to be? Mike: Yes! I tell people all the time that children are a 'covenantal' thing, that is that you love them because you have decided to, and at first it's a one way thing. They take and you give. It's like God's love for us. JFH (Alex): Larry David, the creator of TV's Seinfeld, said once in a Rolling Stone article that kids were an interesting thing, because he couldn't give them back, he couldn't run away and not be their dad. It was the first relationship he had that he couldn't just break off. They were always going to be his kids, no matter what he did. It really blew his mind. Mike: That's interesting. Yeah, they are part of your life. JFH (Alex): And we want to protect them, so it's natural to try to shield them via a 'safe' culture of music and movies and activities. But does this minimize the 'Cathedral' idea a bit? Wouldn't that kill some of the 'us vs. them" thinking that is so pervasive in church culture, if we trusted the Spirit inside us to guide us and our kids through this life instead of instilling fear in our youth group kids about how to avoid getting 'entangled' with the world? Mike: Oh man! Did you see the video we made a while back called "Chair"? It's all about that. What if we served the lost, made ourselves 'lower' and 'available.' That would help solve the "us and them" thing that we have taught our youth groups kids for so long now. We have forgotten that we are supposed to 'serve' all of mankind like Christ did. He went everywhere there were people. It's good to use wisdom with who you hang out with, especially in the teenage years, and to teach our kids to be wise. But we can never forget that we are called to serve, to be where the people are. JFH (Alex): Amen. I really liked "We Won't Numb The Pain / Fire;" I haven't heard so many songs or speakers take on the way we 'check out' on life though entertainment or media consumption, the way we numb the pain by distraction. Mike: Yeah, it's a real issue-- the way we submerge ourselves in online life in response to the hard world we live in. I'm well aware that I'm in the entertainment industry, but 'tuning out' life is a real issue. JFH (Alex): Did this thinking about individuality vs. community, this theme of the album come from something you realized by watching or reading something? Was there an "ah-ha!" moment? Mike: Well, it came mostly from conversations I've had recently with various church leaders I've been interacting with the last few years or so. We kept coming back to the same topic, and that's usually how I start writing. JFH (Alex): I saw that promo video for the album where you quote lyrics and album titles from the first three albums to build on a theme of what you guys want to talk about with your current album and tour. I was shocked with how well the themes of the albums you've done go together to build on a grand theme, so to speak. Is this intentional planned out? Mike: No, but if we are listening to the Spirit and a big theme emerges over time, then praise God. JFH (Alex): You mentioned "capitalistic culture" as a sometimes impediment to living authentically for God. Is being in an industry that encourages self-promotion, sales and image a tough thing? Mike: Oh yeah. It can be a minefield. But it's the context we find ourselves in, so we've decided to work within it. I will say I believe in entrepreneurship. There is something honorable about creating something from the ground up, something honorable about hard work and perseverance. It's a tricky balance, that's for sure. JFH (Alex): That's well said. Mike: Thanks man. Hey, I think I'm over my time. I have another call I have to make. This has been great. JFH (Alex): God bless Mike, enjoy Baltimore. 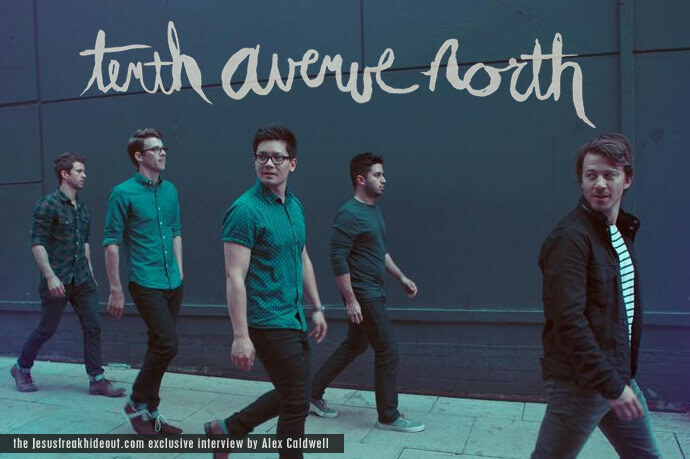 Tenth Avenue North's latest album, Cathedrals is available now wherever music is sold!